Keep baby close by and comfortable with the Safe Stages? Play Yard. 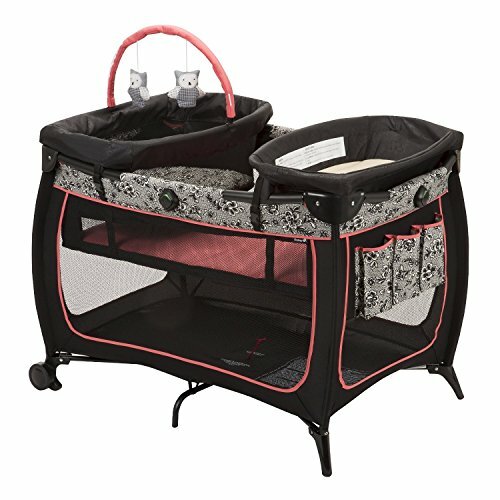 This three-way convertible play yard adjusts easily to keep your growing baby comfortable through three stages. The newborn napper is perfect for newborns up to 15 pounds and includes a fun toy bar for visual stimulation. For more room to stretch out, the full size bassinet can be used up to 20 pounds. Switching to full play yard mode to give your child a wonderful place for both naps and play.The convenient changing table can be used up to 25 pounds. It can be used on either side, making it easy to get the perfect position when setting it up in different rooms. Storage to keep diapers, wipes and other necessities is close at hand. (It may not make the changes fun, but it does make them easier and more comfortable for both of you!) In full-sized play yard mode, there?s plenty to see. Thanks to the breathable mess sides, you?ll be able to easily check in from across the room. Your baby will stay safely out from under foot while still being able to watch all the action. The included carry bag lets you fold the play yard down and easily stow it away in a closet for storage or in the car for a trip away from home.